Designed for amateur modelers, 123D Creature is a sweet looking app which enables you to create three-dimensional renderings. Start with a skeleton, add some limbs and start working your way outward. Before you know it, you have a 3D canvas to start decorating using your finesse and creativity. 123D Creature is a virtual clay sculpting tool which allows you to modify and manipulate 3D objects using digital versions of common clay sculpting tools. The best part is that you will not get splattered with clay and water while you try to mold things into your personal vision, as warped as it may be. 123D Creature is similar to Autodesk’s 123D Sculpt application, but 123D Creature allows you to export your rendering to Sculpteo and have produced on a three-dimensional printer. Do not expect the 3D printing to come cheap however. 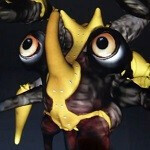 123D Creature was just released and has a promotional price of $1.99 (normally $7.99). The app will do things like keep your model symmetrical automatically if you wish, and if you become a real power user of other 3D rendering tools, the files can be exported as OBJ files for use on desktop applications. Naturally, you can share your vivid imagination via Facebook or Twitter. If you have been wanting to tempt your “inner artist” but paint brushes and canvass were not your thing, maybe creating three-dimensional monsters is your thing. 123D Creature is available in iTunes now. Check out the screen shots and videos below. 123D Creature does a lot of the work for you, enabling symmetrical development so you are not having to redesign each side of your beast as you create it. 123D Sculpt is a predecessor to the Creature app and provides an idea of the power behind these applications for the iPad. Looks good. Hope they will bring it to Android.